← Martintxo goes to NYC! A 2.5 hour shuttle ride later indeed, aboard the same ‘bus’ Martín took from his hotel to Bar Basque, if you recall the mention of which went straight to my corazón faster than a foie gras burger from Boulud would, we–the notable members of the Basque government such as Patxi Lopez and Joxe Mari Aizega and renowned chefs such as Martín Berasategui and Juan Mari Arzak, and other Basque lackeys and myself–found ourselves at the Culinary Institute of America in Hyde Park, NY. A quaint town we never got to know because as soon as we arrived, we were sent to the press room. 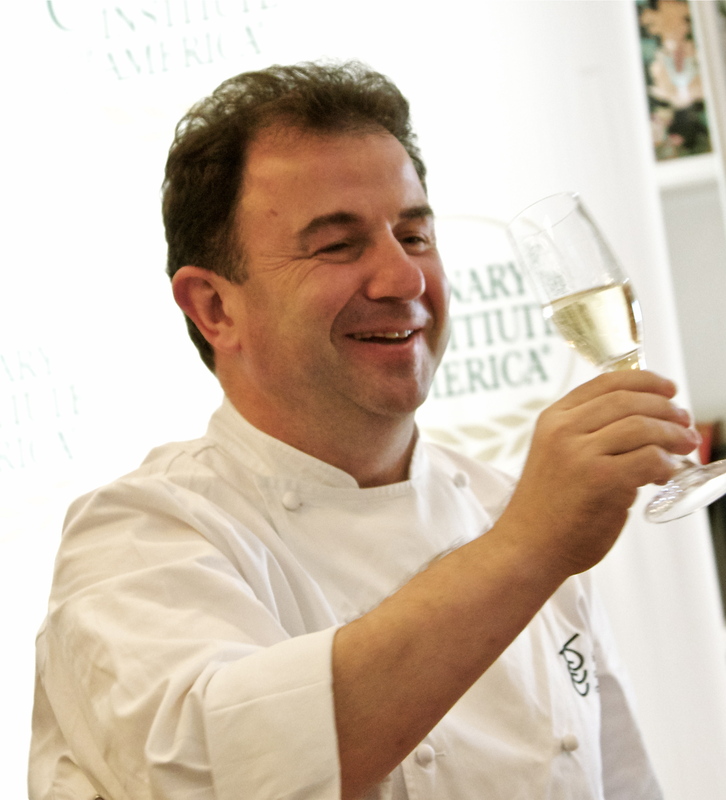 Here they sat at an awkward oblong table, team America on one side with CIA president Tim Ryan and his entourage, and on the other, team Basque, the Lehendakari Patxi Lopez, Joxe Mari, and chefs Martín, Juan Mari and Andoni (who happened to pop out of the woodworks). Whoever made the executive decision to buy this long, oval, completely-inconducive-to-us-photo-takers-table did not have enough foresight. To make matters more difficult, across from the importantes mentioned above, sat the who-bodies. Who? Presumably the majority were lackeys because they were not taking photos and there weren’t possibly enough press releases post-event to assume they were associated with the international press. From what I saw (or perhaps did not see), they and their hair-sprayed updos did nothing but obstruct my view. Perhaps that is why there were so few photographs published following this event. I imagine Martín and I were thinking the same thing at this point. Champagne. Having spent the entire morning preparing and cooking for 24 semi-important strangers and then rushing to board a stuffy 2.5 hour shuttle bus, only to sit, smile and wait patiently for applause and a toast, it’s only natural we were dreaming about the champagne oasis, a refreshing glass of cool, tiny bubbles to quench our everything. I suppose such is the life of a celebrity chef. Sometimes you have to skip breakfast, skip lunch, skip the loo. Such is the sacrifice you make to please others because don’t forget, this is the service industry. We are in the business of pleasing others. 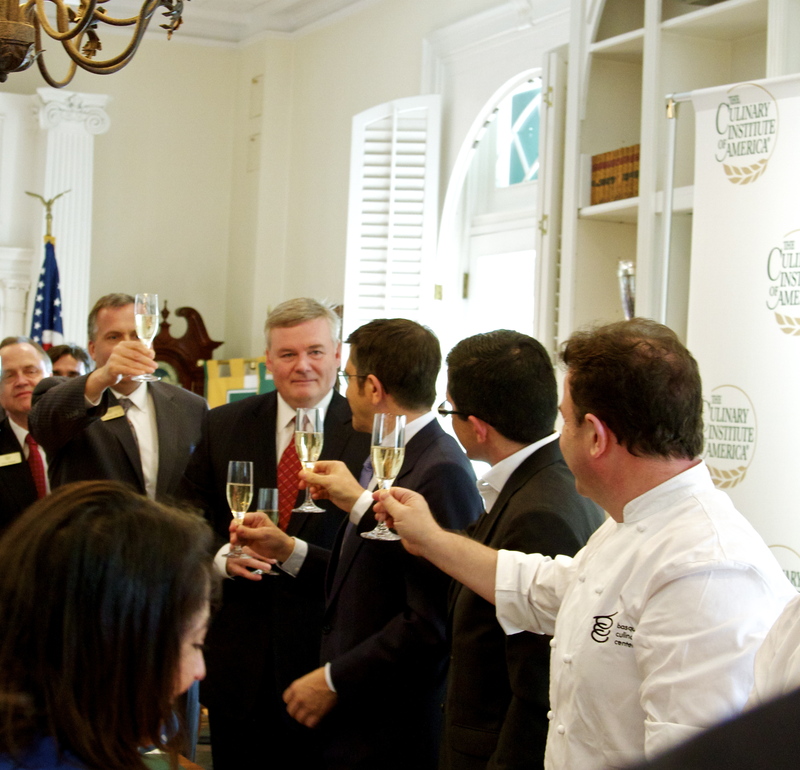 So cheers they did to future alliances between Basque Culinary and CIA, and us to a wonderful adventure in New York. 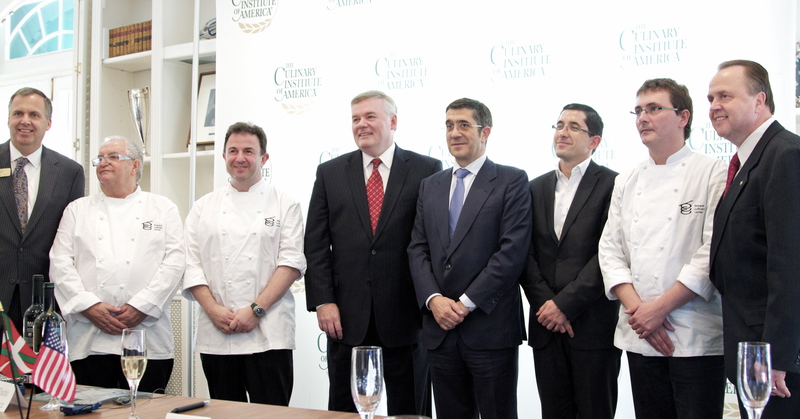 This entry was tagged Andoni Luis Aduriz, champagne, CIA, Joxe Mari Aiztega, Juan Mari Arzak, lehendakari, Martín Berasategui, Patxi Lopez, Tim Ryan. Bookmark the permalink. I am hoping that such alliances might help open the eyes of Americans to the wonders of Thermomix. So sad that the super kitchen machine is not sold in USA, but then, perhaps this is one tool that gives the Basques a culinary edge…? Hmmmm.